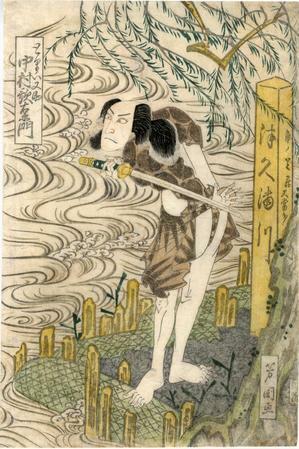 Torii Matasuke is tricked into killing his own master. Here he is waiting along the bank of a river for the man he thinks is his enemy to arrive. This is the right-hand sheet of a diptych which depicts Nakamura Utaemon III as Torii Matasuke and (left sheet, missing) Bandō Mitsugorō III as general Taga in Courtesan and Mirror Mountain (Keisei Kagamiyama - けいせい双鏡山), Kado no Shibai, Osaka, 1/1821. See Schwaab, Osaka Prints, no. 31, p. 75. This information was supplied by John Fiorillo.